The only lifelong bachelor to be president in U.S. history, James Buchanan is famous for leaving a troubled legacy as America’s 15th president. Buchanan is also popular for other things; not only is he believed to have probably been the first gay U.S. president, he is also the only president from Pennsylvania and was Abraham Lincoln’s predecessor. James is regarded by many historians as one of the most inept and worst presidents of all time due to his alliance with slave states and his inability to stop the Civil War. Be inspired to new discoveries as we unearth lesser-known facts about the former president who stirred up mixed feelings among his people. A Pennsylvania native, James Buchanan was born on April 23, 1791, in Cove Gap to Elizabeth and James Buchanan Sr., a wealthy merchant and farmer. He attended Old Stone Academy and later Dickinson College where he graduated from in 1809. After college, Buchanan relocated to Lancaster, Pennsylvania, where he studied law. In the year 1812, he was called to the bar and thereafter served in the military during the 1812 war. Before his reign in the nation’s highest office, Buchanan had an impressive résumé and was no political novice. He was a successful lawyer, a five-time member of the House of Representatives, the secretary of state under President James Polk, and the U.S. ambassador to Russia and Great Britain. A member of the Federalist Party, Buchanan’s political career began in the Pennsylvania state legislature from 1814 to 1816 and went on to serve in both houses of the U.S. Congress. Buchanan became president under somewhat traditional but trying circumstances. In 1857, he successfully defeated Republican candidate John C. Fremont and was sworn in as the 15th president of the United States. President Buchanan was a Democrat morally opposed to slavery but believed it was protected by the U.S. Constitution. Though he tried to maintain peace between pro-slavery and anti-slavery factions in the government, tensions still escalated. He remained at the helm of the nation’s affairs during the build-up to the Civil War until 1861. The American Civil War (1861-1865) which Buchanan was ultimately blamed for, began a month after he left office to be succeeded by Abraham Lincoln. James Buchanan is usually ranked as one of the most incompetent and worst presidents in history. According to historians, his failure as a leader stemmed from his ideological roots. See Also: Abraham Lincoln Bio, Wife, Children and Other Family Members, Was He Gay? Buchanan retired to his estate in central Pennsylvania and lived to see the end of the Civil War. He devoted much of his retirement days to defending his handling of events leading to the Civil War. In 1866, the former president found solace in writing and publishing a memoir, in which he justified his actions as president and blamed the war on abolitionists and Republicans. After his book, Buchanan retreated into privacy. Nonetheless, he always viewed himself as a good leader and “competent public figure” and before his death, he hoped that history will vindicate his memory from every unjust aspersion. Buchanan died on June 1, 1868, at age 77. He was buried at Woodward Hill Cemetery in Lancaster, Pennsylvania. Buchanan is the only U.S. president who never married. In 1819, he was briefly engaged to Ann Coleman, the daughter of a wealthy man. However, the marriage never went through, as Coleman broke off the engagement that same year. History has it that their engagement was an unhappy one that was not based on genuine affection. There were speculations that Buchanan was also seeing other women during that time. Soon after Coleman called off the engagement, she died unexpectedly. Coleman’s death was rumored to be a suicide and her father who never approved of the couple denied Buchanan permission to attend the funeral. During Buchanan’s time as president, his niece, Harriet Lane assumed the social duties of the first lady. Given that Buchanan never married and was the only U.S. president to remain a bachelor his entire life, his sexuality raised eyebrows. In fact, it is speculated that if the American society was more liberal and gay marriages had been permitted in the 19th century, he may not be known today as the only bachelor president in U.S. history. 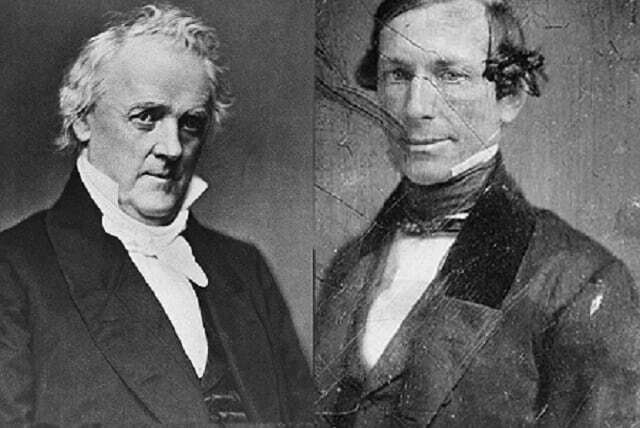 Some historians believe that in his lifetime, Buchanan had a very close relationship with William Rufus King, an Alabama senator and Franklin Pierce’s Vice President. Buchanan and King were so openly close and lived together such that they were nicknamed “Miss Nancy” and “Aunt Fancy.” Also considered as Buchanan’s ‘better half’, King and the former president presumably made little efforts to keep their relationship secret, and the two remained close until King’s death in 1853. While there is no doubt that the two men had a strong attachment, the nature of Buchanan and King’s relationship was, however, never officially established as being sexual. More so, on Buchanan’s request, all of the former president’s correspondence was destroyed after his death.